My story begins days before my 30th birthday in a rundown cardiac ward of the biggest hospital in Prague. In hindsight, I consider it a blessing and a life changing moment, and Ironheart played a large part in it. I’ve started running in my 20s, as a way to blow steam and keep fit while pursuing a demanding international career. While I’ve never been a fast runner, I had no lack of drive and short runs soon turned into half marathons and then marathons. By the time I turned 30, dozens of long-distance races behind me, I was ready for a new challenge, a triathlon! It was supposed to be my gift to myself for my 30th birthday, which was a reaffirmation of fitness, vigor and power. Instead, it turned into a wake-up call. During a routine health check I promised to my wife, I found out that I was born with a bicuspid valve. That same night, I wrote dozens of mails to many doctors and cardiac communities, seeking experiences and solutions. The very next morning, I had the only answer I would ever receive. It would be the only answer that I would need in the end. It came from Ironheart and a personal letter from its founder Dave Watkins. I was far from alone, and Ironheart over time provided all the answers that I needed. Soon after, based on Dave’s recommendation, I visited an excellent cardiologist in the US who he is still in charge of my care. The fact that I am based in Amsterdam, Netherlands, and fly annually to the U.S. solely for this purpose speaks volumes of the kind of wonderful care I receive. Ironheart members and volunteers led by Dave continue to inspire and provide support and encouragement to this day. If I ever need surgery, I know I will have the support of a wonderful community of people who understand this battle better than anybody. 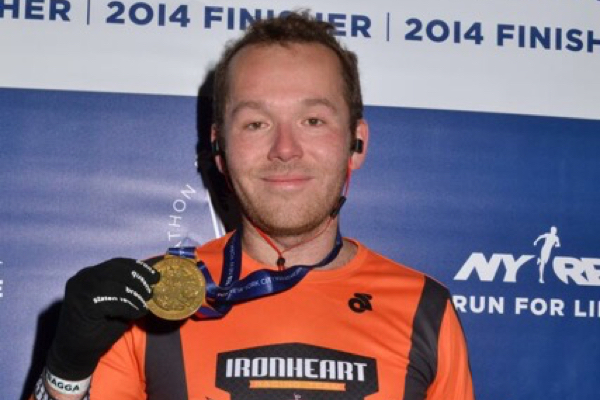 Facing no symptoms to date, I’ve continued running and competing in triathlons ever since the diagnosis, proudly wearing the Ironheart shirt and representing the cause. For every athlete, being faced with prospect of heart disease is a soul-crushing event. From self-perception of health and vitality, one is imminently faced with a need to manage a chronic disease in one place every athlete considers to be in top shape – one’s heart. I consider myself extremely lucky to have found Ironheart in such a difficult moment and perhaps finding it really was the best 30th birthday gift I could wish for.